HE SALE OF relics, church offices, and indulgences I became big business within the church of the Middle Ages. Pope Boniface VIII declared a jubilee for the year 1300 and offered liberal indulgences to those who would make a pilgrimage to St. Peter's. An estimated 2, 000, 000 people came within that year and deposited such treasure before the supposed tomb of St. Peter that two priests with rakes in their hands were kept busy day and night raking up the money.1 Much of this was used by the pope to enrich his own relatives—the Gaetani—who bought numerous castles and splendid estates in Latium. This was strongly resented by the people of Rome. From the days of Constantine, the Roman church had increased in wealth at a rapid pace. In the Middle Ages, the church owned entire cities and large portions of land. Those who lived in Catholic countries were required to pay taxes to the church. This was not giving from the heart, but fees paid "of necessity"—a principle which was opposed by the apostle Paul (2 Cor. 9:7). In those days, few people knew how to write, so priests were often involved in drafting wills. In 1170 Pope Alexander III decreed that no one could make a valid will except in the presence of a priest! Any secular notary who drew up a will (except under these circumstances) was to be excommunicated!2 Often a priest was the last person to be with a dying man, for he would give the last rites, the Extreme Unction. With such arrangements, we can be sure the Romish church was well remembered. Another source of money was the selling of indulgences. The Catholic Encyclopedia explains that sins committed after baptism (which for a Catholic is usually in infancy!) can be forgiven through the sacrament of penance, "but there still remains the temporal punishment required by Divine justice, and this requirement must be fulfilled either in the present life or in the world to come, i.e. in Purgatory. An indulgence offers the penitent sinner the means of discharging this debt during this life on earth. 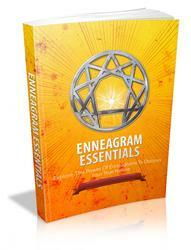 "3 Many have only had a general idea of what the word indulgence implies. Another thing that is not well-known about indulgences is the basis, according to Catholic belief, on which such are granted. According to The Catholic Encyclopedia, the basis or source for indulgences is the "Treasury." This includes the infinite redemptive work of Christ who is the propiti-tiation for sins (1 John 2:2), "besides"-notice the word!— "there are the satisfactory works of the Blessed Virgin Mary undiminished by any penalty due to sin, and the virtues, penances, and sufferings of the saints vastly exceeding any temporal punishment which these servants of God might have incurred." Because of the works these have performed, there is an extra supply or treasury of merits, merits which make it possible for indulgences to be shared with others of the church who have not been as saintly! Such was the doctrine dogmatically set forth in the Bull "Unigenitus" of Clement VI in 1343. "According to Catholic doctrine, therefore, the source of indulgences is constituted by the merits of Christ and the saints. But if Christ "is the propitiation for our sins" and his blood "cleanseth us from all sin" (1 John 1:7; 2:2), in what way can the merits of Mary and other saints possibly add to this? What Mary or other saints did can add nothing to the completed work of Christ at Calvary. To us, such rigmarole provides no support for the indulgence doctrine, but identifies it, rather, as a man-made fabrication. 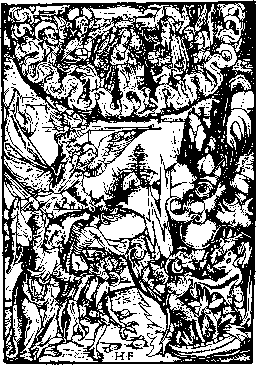 Woodcut of indulgence sales by Jorg Breu the Elder (16th century). At the time of Martin Luther, because of construction work on St. Peter's, a special drive was made by the pope to raise money through the granting of indulgences. John Tet-zel, known to be a man of poor conduct, but one who had ability as a quack fund raiser, was appointed to sell indulgences in Germany. The following is given as an eyewitness description of Tetzel's entry into a German town. "When the indulgence-seller approached the town, the Bull (the pope's official document) was carried before him on a cloth of velvet and gold, and all the priests and monks, the town council, the schoolmasters and their scholars, and all the men and women went out to meet him with banners and candles and songs, forming a great procession; then with bells ringing and organs playing, they accompanied him to the principal church; a cross was set up in the midst of the church and the pope's banner displayed; in short, one might think they were receiving God himself. In front of the cross was placed a large iron chest to receive the money, and then the people were induced in various ways to buy indulgences." It is said that Tetzel carried with him a picture of the devil tormenting souls in purgatory and frequently repeated the words that appeared on the money box: Sobald der pfenning im kästen klingt, kie seel' aus dem Fegfeuer springt, which freely translated means, "As soon as the money in the casket rings, the troubled soul from Purgatory springs." The rich gave large donations, while poverty stricken peasants sacrificed what they could in order to help their loved ones in Purgatory or to obtain pardon for their own sins. In Medieval universities, those who wished to advocate certain opinions would publicly post "theses"—statements of their ideas—and invite discussion on these points. Following this custom, Martin Luther nailed his famous Ninety-five Theses to the door of the Castle Church in Wittenberg, Germany. (His twenty-seventh point was against the idea that as soon as money went into the collection box that souls would escape from Purgatory.) It was not at the Castle Church, however, that Tetzel preached. Indulgence preaching was not allowed in Wittenberg. But many of the people from Wittenberg had gone to hear Tetzel speak at Jüterbog, a nearby town. Luther began to speak out against the selling of indulgences and, eventually, against indulgences as such. He was denounced in a Bull of Pope Leo X for saying, "Indulgences are pious frauds...In-dulgences do not avail those who really gain them for the remission of the penalty due to actual sin in the sight of God's justice." really a settled peace in the matter. There is always the possibility that more money should be given on behalf of loved ones who have died. To play upon the love and tender memories of bereaved people, to take money for masses and long prayers, brings to mind those Jewish priests at the time of Jesus who would "devour widows' houses, and for a pretence make long prayer" (Matt. 23:14). High Mass can be very expensive, depending on the flowers, candles, and number of priests taking part. It is sung in a loud tone of voice. The low Mass, on the other hand, is much less expensive—only six candles are used and it is repeated in a low voice. The Irish have a saying, "High money, HIGH Mass; low money, LOW Mass; no money, NO MASS!" Those who die without anyone to pay for Masses in their behalf are called the "forgotten souls in Purgatory." However, these are remembered in special prayers on November 2, "All Soul's Day." If a Catholic fears he might become one of the "forgotten souls", he may join the Purgatorian Society which was established in 1856. A contribution each year to the society will assure him that, upon his death, prayers will be said for his soul. During World War II, the Archbishop of Winnipeg, in a letter dated March 1, 1944, urged Roman Catholic mothers to guarantee the salvation of their sons from Purgatory by the payment to him of $40 for prayers and masses in their behalf. I will say it here quite clearly, whether he be Pagan, Papal, Protestant, or Pentecostal, no pope, priest, or preacher can guarantee the salvation of anyone, living or dead, on the basis of any amount of money given for his prayers. The Bible says it is hard for a rich man to enter into the kingdom of heaven (Matt. 19:23, 24). But if the payment of money could help a person escape from Purgatory and go to Heaven, just the reverse would be true. Instead of it being "hard" for a rich man to enter heaven, riches would be a "help." The Bible says, "They that trust in their wealth, and boast themselves in the multitude of riches; none of them can by any means redeem his brother, nor give to God a ransom for him" (Psalms 49:6,7). If money cannot redeem a brother who is alive, how could it redeem him if he is dead? There can be no mistake as to where Peter stood on the matter. He plainly says we are "NOT redeemed with corruptible things as silver and gold...but with the precious blood of Christ, as of a lamb without blemish and without spot" (1 Peter 1:18, 19). When the former Samaria sorcerer offered money to obtain a gift of God, Peter said, "To hell with you and your money! How dare you think you could buy the gift of God?" (Acts 8:20). These words are from the translation by J. B. Phillips to which he adds a footnote: "These are exactly what the Greek means. It is a pity that their real meaning is obscured by modern slang." Roman Catholic ideas about Purgatory (and prayers to help those in Purgatory) were not the teachings of Christ and the apostles. Such were not taught within the Romish church to any great degree until around 600 when Pope Gregory the Great made claims about a third state—a place for the purification of souls before their entrance into heaven—and did not become an actual dogma until the Council of Florence in 1459. Old German drawing typical of the art and and demons near the mouth of Purgatory. There is an elaborate description of purgatorial suffering in the sacred writings of Buddhism. 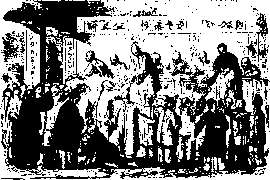 There have been times when so many of the Chinese Buddhists came to buy prayers for the deliverance of their loved ones from purgatory that special shops were set up for this purpose. (Above illustration.) In the religion of Zoroaster, souls are taken through twelve stages before they are sufficiently purified to enter heaven. The Stoics conceived of a middle place of enlightenment which they called Empurosis, that is, "a place of fire. "10 According to Moslem doctrine, the angels Munnker and Nekier question those who die as to their religion and prophet. Many of these go into purgatory, but through money given to a priest an escape may be provided. Baby offered to Mo lech. It is very possible that concepts about purgatory and certain ideas linked with Mo lech worship all stemmed from the same source. It appears that various nations had the idea that fire, in one way or another, was necessary to cleanse from sin. 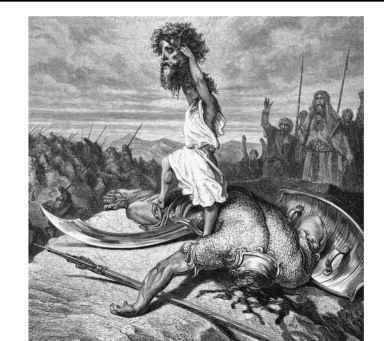 The Israelites were repeatedly forbidden to let their seed "pass through the fire to Molech" (Lev. 18:21, Jer. 32:35, 2 Kings 23:10). Molech (who some identify with Bel or Nim-rod) was worshipped "with human sacrifices, purifications... with mutilation, vows of celibacy and virginity, and devotion of the firstborn. "12 Sometimes he was represented as a horrible idol with fire burning inside so that what was placed in his arms was consumed. In the above illustration, a heathen priest has taken a baby from its mother to be offered to Molech. Lest the parents should relent, a loud noise was made on drums to hide the screams. The word for drums is tophim from which comes the word "Tophet,"13 the place mentioned in verses such as Jeremiah 7:31: "They have built the high place of Tophet...to burn their sons and their daughters in the fire." While drums sounded, bands played, and priests chanted, human sacrifices were devoured in the flames. How pitiful to think that by such cruel rites, or by the payment of money, men think they can pay for their sins. The good news is that the price has already been paid—by Jesus Christ! Salvation is by grace—by favor that could never be merited by money, human works, or sacrifices. "For by GRACE are ye saved through faith; and that not of yourselves: it is the GIFT of God: not of works, lest any man should boast" (Eph. 2:8, 9).